Much has been made about Big Bird becoming an endangered species should a certain GOP nominee become President, but the defunding of PBS would be a big deal. Only on PBS could you have an even-handed, in-depth 2-hour documentary on the complete lives of the two men running for president, without sponsors, without an agenda, and thus without fear of repercussion. Frontline's The Choice 2012 was Masterpiece Theater indeed. The program is divided up into alternating segments on each candidate, and it bounces around in time a little since Mitt Romney is significantly older than Barack Obama. The Frontline brain trust is too smart for chapter titles, but I'm not. The program opens up with Romney's first launch into politics, the 1994 Massachusetts senatorial debate with Ted Kennedy at Faneuil Hall. It shows Romney, a handsome 47 at the time, as very poised and articulate. Ultimately he was deconstructed by the consummate political pro. But Romney was in the game at a high level and learned from his defeat. Obama's run at Congress in 2000 was a lot less rewarding. In a primary battle to unseat incumbent Dem Bobby Rush (IL-1), he was painted as a bookworm who wasn't black enough to win on Chicago's south side. He had "more degrees than a thermometer" but was a "Harvard-educated fool." Obama lost by 30 points. His political career was at a crossroads, and Michelle wanted him to give it up. Mitt Romney grew up in a solid family with great schooling in Michigan. His father George is painted reverentially as a self-made, straight-talking, and larger-than-life father figure. A man born on a polygamist compound in Mexico with no college degree became the President of American Motors and moderate Republican Governor of Michigan. Mitt watched from the arena floor at the 1964 GOP convention in San Francisco when his father walked out during Barry Goldwater's extremist acceptance speech. Mitt enrolled at Stanford, but the area was rife with the counter-culture of the mid-1960s. Romney was a creature of the previous era and didn't belong there. 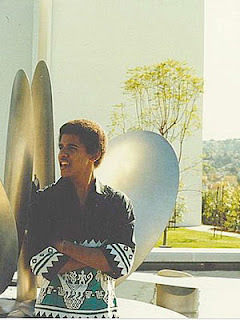 "Barry" Obama had no real structure in his formative years. His father was out of the picture, his mother got married and dragged him to Indonesia, and he returned to Hawaii at age 10 to live with his grandparents. He was a "black-looking white kid" without any real family identification. But his non-affiliation with a single group made him adaptable to all groups. In high school, he became the ringleader of a diverse group of kids that called themselves "The Choom Gang." They were typical laid-back Hawaiians who were very inclusive and smoked a lot of dope. Romney left Stanford after one year to go to France for his LDS mission. It was there he knocked on thousands of doors trying to find would-be converts, and learned a lot about rejection. He also saw the dark side of politics from afar as his father George was vilified for his comment about being "brainwashed" by US military leaders regarding the Vietnam war. In 1968, Romney had a near-death experience in a car accident in France that killed the passenger in the vehicle, the mission's mother. The under-publicized event is said to shape Mitt's life in his bolstered faith, his burning ambition, and overwhelming drive to succeed. His life was spared and he was going to make it count. Obama enrolled at Occidental College in LA. Again, he couldn't be put in a box. He was the easygoing black kid who was always in Hawaiian shirts and shorts. The international crowd of college was something that "Barry" pulled together. But at some point he realized that he was just floating along, and he transferred to Columbia University in New York City. It was there he saw the poverty and urban struggle, and decided to get serious about his life. That's when Barry decided to return to his given name, Barack. After 4 years in New York which remain largely a mystery, Barack took a job as a community organizer on Chicago's south side to get on the ground in the inner city and do good works. But being an outsider and a do-gooder wasn't enough to change anything, so he went to go get a law degree. When Romney returned from France, his high school girlfriend Ann Davies was literally waiting for him. She had embedded herself with the Romneys during his absence, and they converted her. She and Mitt were married 3 months after his return. Romney finished his undergrad work at BYU and then went to Harvard Law and Business School. The law degree was what his father wanted, the business degree was what he wanted. Romney's timing into the business world was fortunate. The "corporate ladder" structure was becoming a thing of the past and now outsiders were being contracted to "consult" and make businesses more cost-efficient from the top down. Romney was hired by Bill Bain, took a chance on Staples which came up huge, focused Bain Capital on "leveraged buyouts," and the rest is history. Romney made hundreds of millions for himself and his investors. Obama got a glimpse of future partisan wars while at the Harvard Law School. In a most politically-contentious environment, he became the first black president of the Harvard Law Review, and was known to reach out to both sides. He saw his job was to put out a first-rate publication, and politics didn't figure in. With that on his resume, Obama could have clerked for a Supreme Court Justice or the U.S. Attorney's office, but chose to return to Chicago to work in the community and teach law. It didn't hurt that while he was a summer associate at a law firm there, he met a young lawyer named Michelle Robinson. Romney became a Bishop in the Mormon Church, where he realized the tension in that role. He was convincing those to live by the scripture, but at the same time there was the missionary element with a need to help those who needed it most. The LDS credo is "build the Kingdom of God upon the Earth." Romney, as a church bigwig, saw himself as a vessel for that end. When a bribery scandal engulfed the 2002 Salt Lake City Olympics, they called in Mitt Romney to save it. Mitt took on the challenge despite Ann's recent diagnosis of Multiple Sclerosis. He lined up corporate sponsors (and lobbied the federal government) for big money and put forward a high-end product. Ann Romney ran with the torch and Mitt Romney stood with the President for the opening ceremonies. In 2004, Barack Obama was a hardly-known State Senator from Illinois who was somehow selected to deliver the keynote address at the 2004 DNC. It was his famous speech about unity and inclusion, the speech he'd been writing his whole life. 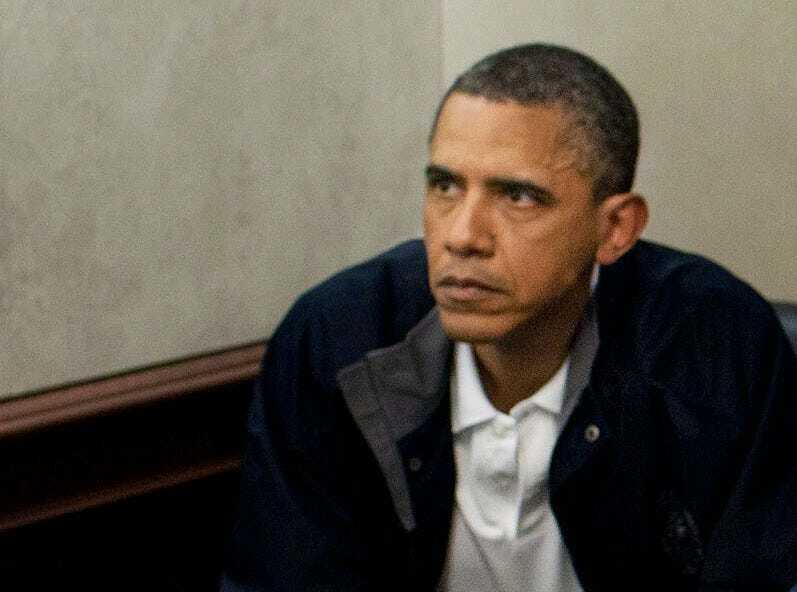 After elected Senator in 2006, Obama rapidly grew bored as a cog in the machine. Since 2008 would be a free-for-all, Obama was advised not to wait and live a life of a career back-bencher (his VP choice comes to mind). He ran on the same thing he'd always preached, breaking down the partisan walls and uniting America. Hillary Clinton openly mocked Obama's message and turned out to be more realistic, "You can't wave a magic wand and make special interests disappear." Obama's message won out, and in 4 years he went from an unknown state senator to the most famous man on earth. It was amazing enough to think that anything was possible. Romney ran for Governor in 2002, and had to assume a socially liberal agenda to get elected in Massachusetts. In the gubernatorial debate against Shannon O'Brien, Romney said, "I will preserve and protect a woman's right to choose." She echoed Ted Kennedy's claim that Romney "isn't pro-choice, he's multiple choice." Romney won narrowly, and took his first elected office at age 55. Like Obama, Romney wasn't interested in wheeling and dealing and the backslapping that comes with the political process. He wasn't a political creature, he was an executive, and he had 800 vetoes over-ridden by the state's predominantly Democratic legislature. But Romney did get at least one thing done, something major. He found a way to get health coverage for more Massachusetts residents at a lower cost. It was called the "individual mandate," based on an idea from the Heritage Foundation, a conservative think tank. Romney got the state government to buy in, but needed federal dollars to get it rolling. Enter old rival Ted Kennedy to procure the money from Washington to funnel to The Bay State. 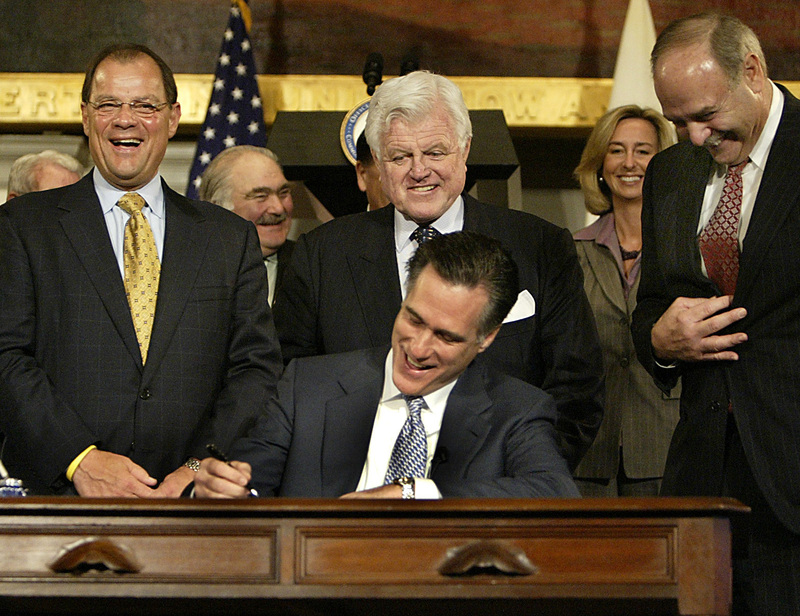 Romney and Kennedy returned to Faneuil Hall to announce the implementation of the law in 2006. Romney was charming and glib, referring to the 1994 debate like "The Titanic returning to the iceberg." Romney and Kennedy were a Vaudeville duo that night. It was the type of bipartisan effort that has eluded Obama from the start. Obama was inaugurated in 2008 clinging to the view that polarization could be overcome. Six weeks into his term, in the midst of a great financial crisis, he tried to pass universal health care but couldn't sell it. He eventually watered down his plan to mirror the one fashioned in Massachusetts by then-governor Mitt Romney. Finally in March 2010, on the 216th vote, the Affordable Care Act ("ObamaCare") passed the House 219-212 without a single Republican vote to what had initially been a Republican plan. It was a party line vote, and a referendum against the President. It wasn't the victory he wanted nor the change he promised. Being President was about working the system, not changing the system. And the system was changing Obama instead. Romney decided not to run for re-election in 2006, instead deciding to focus on the 2008 presidential race. He met with with a prominent Iowa GOP delegation in the penthouse of a Boston hotel and they were blunt with him. They brought up the problem of the Three M's: Mormonism, Massachusetts, and Multi-Millionaire. All three were third-rails to the evangelical, middle-American conservative base. Mormonism meant polygamy, Massachusetts meant "moderate," and Multi-Millionaite meant "out-of-touch." Ann Romney allegedly stormed out of the meeting. Romney made a calculated, "political conversion" on abortion. He lost Iowa, New Hampshire and Florida, and dropped out of the '08 race thinking he'd never have another shot. In 2010, the Tea Party wave led a new freshman class into Congress and the GOP was even more galvanized to thwart Obama's every move. It made him more skeptical, cynical, and ill-tempered. Even moves hard-right by the President on foreign policy couldn't sway any conservatives. While winding down the Iraq war, he ramped up the secret wars, covert operations and drone strikes. He's the only Nobel Peace Prize winner with a kill list. And that agenda hasn't won any friends among progressives. PBS details all the accomplishments in Romney's life. But his campaign, and specifically his campaign against the health care law he created, is symbolic of the candidate he's become. He'll say anything to any crowd, and run away from his achievements to reach his ends, the presidency. But if he doesn't have a consistent core message, what's driving him besides ambition? And how will he govern if he gets there? The answers seem to be "multiple choice." PBS shows Obama's pre-presidency resume as considerably thinner than Romney's. It makes the point abundantly clear that he went from unknown to US President in 4 years, not exactly by luck, but as a symbol of hope and change without the experience to practically accomplish what he had promised. While he has grown in the office and gotten quite a bit done despite the obstruction he's faced, the idealism he represented has been stripped away. If elected to a second term, you have to think that he won't be worried about making any friends on either side. * Editor's Note: This is not a journalistic work. There are paraphrases and misquotes without accreditation. It is a synopsis, a "Cliffs Notes" if you will, of a brilliant documentary by Michael Kirk and Frontline. And a little bit of opinion from the Backtime Editorial Department, as always.